Situated in the heart of Seville on Avenida Menendez Pelayo this all inclusive office space is ideal for established companies and young entrepreneurs alike looking for flexible office space in a strategic business location. This centre is strategically placed close to many eateries, cafes and many parks in which to spend your well-deserved breaks. In addition, the centre itself offers conference facilities, meeting rooms and a comfortable collaborative atmosphere throughout. A contemporary building in the heart of Seville is home to this business centre. These well-designed offices are sensationally situated in a contemporary building with all the amenities you could need day-to-day. Offering fully furnished and equipped private offices along with open-plan office space and also virtual office options, the center offers a solution to what ever your business needs may be. Suitable for single entrepreneurs and established companies alike, this fully furnished and all inclusive office space is located in the Nuevo Torneo Business Park, a prestigious and strategic location which is just 10 minutes from San Pablo Airport. There are many transportation links within reach so that commutes are always pleasant and straight-forward. This includes the nearby bus lines 13 and B5. This centre benefits from a fantastic selection of amenities as well as a number of local hot spots in the surrounding area. Here, you will enjoy cutting-edge equipment, as well as meeting room facilities and conference rooms; for easy access to negotiations, presentations and training seminars. There are many restaurants within reach, as well as the Olympic Stadium, several transport links and a number of parks. This iconic office building provides a range of modern all inclusive office space, five minutes from the San Pablo International Airport area making it a well connected location. Business support services are available while the work spaces are fully furnished. This turnkey solution is ideally located so that commutes are always easy, and there are many hotels nearby where your visiting clients can stay. Situated in the central district of San Julian, one of the city's most active areas, this coworking space provides a peaceful environment to work with like-minded people. It is the perfect solution for those who are also looking for cooperation and mutual support across the multiple networks that inhabit this space, to optimise the perks of their occupancy. Just around the corner, there is a museum: the Marcos Dominguez Taller de Escultura. 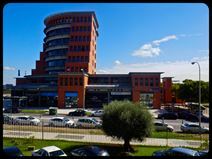 Located in the heart of Seville this business centre provides excellent, high quality office space and facilities for any size business. The offices are furnished and there are also spacious meeting and conference rooms all with perfect network access and professional support services. The centre is close to the shops, cafés, restaurants and hotels, it also benefits from excellent transport links. Located in the centre of Seville the centre is easily accessible using public transport. Office come fully furnished and on flexible terms, and you can gain access to the space 24 hours a day, 7 days a week so it is perfect for any kind of business with any kind of working hours. The space is a short five-minute walk away from Plaza de Espana where you can enjoy the landscape and large water feature with sitting area. Found in the heart of Seville, this beautiful building has a stunning exterior with a very comfortable and spacious interior. This is an ideal location for professionals wishing to work in the heart of Spain, in a flexible manner with a choice of private offices, collaborative meeting spaces and social lounge areas. With 24 hour access you can work around the clock, and the building is easy to reach by public transport with secure car parking available too.